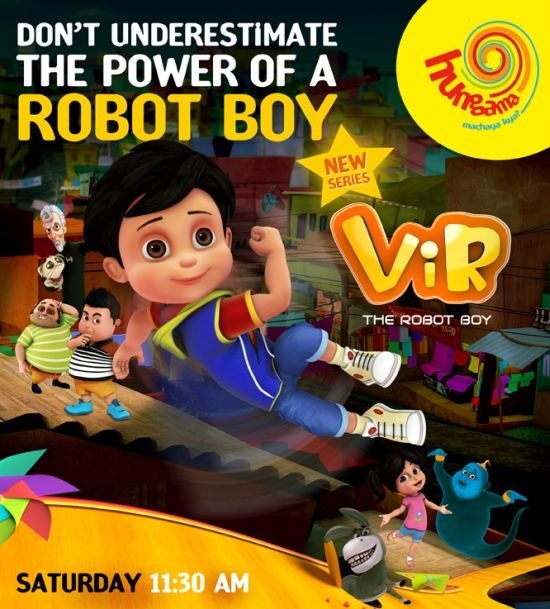 November 6th, 2013: In line with its new look and proposition of Hungama Machaya Kya, Hungama TV will premiere a brand new series, VIR: The Robot Boy. A weekly animated comedy/adventure series set in the desi heartland of India. The channel has associated with Maya Digital to bring this show weekly starting November 9th, 2013 at 11.30 am. Vir is a heartwarming story of a robot with human like qualities and a unique blend of emotions and superhuman abilities. The series follows his humorous escapades as he manages to save the day with his quick thinking and a wide array of robotic abilities, along with his closest friends – Chulbul the pet Donkey, 8 year old Imli and Gintu, his magical Djinn. Vir is naughty yet intelligent, funny yet compassionate, playful yet helpful and street smart yet has a golden heart, all of which define the kids of today. “We recently launched a fresh new look for Hungama TV, which embodies the spirit of friendly mischief and spontaneous laughter which is our core proposition for the channel. VIR: The Robot Boy truly celebrates the spirit of childhood and personifies what the channel represents. We are confident that kids will develop a great affinity to the local narrative, humour and situations that Vir and his friends find themselves in” said Devika Prabhu, Director, Programming, Kids Network, Disney UTV.